The interior of a newly constructed Evanston indoor soccer facility is shown. Located at 2025 Dempster St., the space will be used by Evanston’s youth soccer program when weather makes it impossible to play outdoors. Evanston’s unpredictable weather of all kinds — snow, bitter cold, gusting winds — will no longer be an issue for the city’s youth soccer program. An indoor soccer facility for more than 40 teams is scheduled to open in April, Evanston Soccer Association vice president Lander Brown said. Team Evanston, which runs soccer teams for high school boys and girls, chose a vacant building located at 2025 Dempster St. 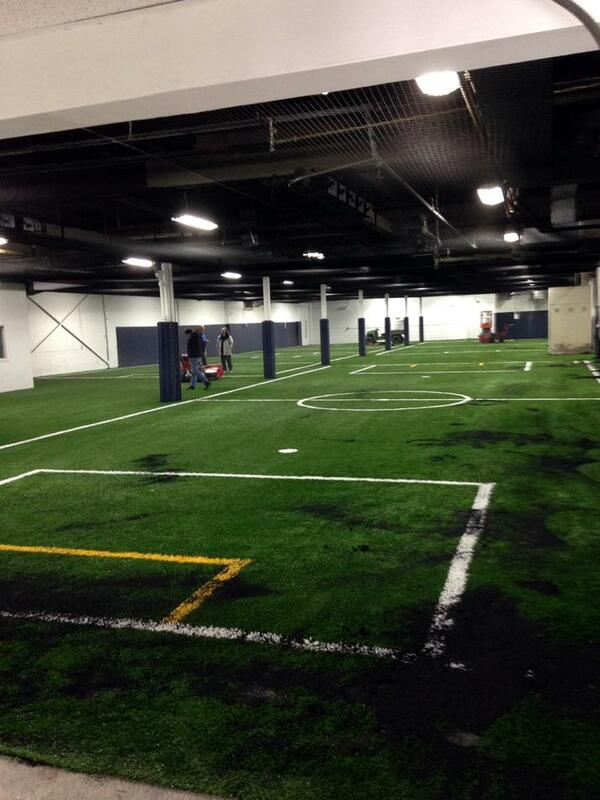 Turf was laid down to transform the space, formerly a warehouse, into four small soccer fields, Brown said. When initially looking for a place, Brown and the other board members looked for a facility that would be “a safe place for kids to practice.” The building provides the organization with the opportunity not only to have indoor soccer training, but also to have administrative offices for staff, he said. Team Evanston board president Matt Tobin said the organization has had the idea for an indoor center since he began his term three years ago. Tobin said Evanston’s brutal weather, which often brings chilly temperatures and precipitation, frequently forces practices and games to be cancelled. Currently, teams have to either practice in small school gymnasiums or travel as far as Highland Park and Palatine, Ill., to play at indoor fields. Ald. Peter Braithwaite (2nd), whose daughter plays soccer, complained about the long trips for tournaments and games. The soccer facility is located only a few blocks from Evanston Township High School. This proximity allows for a potential collaboration between the high school’s soccer program and Team Evanston, Braithwaite said. Tobin and Brown said that while the indoor space will primarily be for Team Evanston administration and the organization’s teams, the board is still looking into how else the facility could be used. Brown said they’re considering hosting soccer workshops, as well as making it available to ETHS sports teams for practice. Team Evanston is planning to use the addition of indoor space as a way to expand the soccer program to more of the community, both in Evanston and in surrounding towns, Tobin said. He called the new space a “tremendous leverage” for the organization’s push to make soccer a year-round intensive sport.